In the spirit of the holiday season search engine giant, Google, has announced that are extending free Gmail-based Google Voice calling to the US and Canada for all of 2011. The promotion was originally going to be over at the end of this year, but Google has decided to extend it all the way till end of next year. The Gmail calling feature was a pretty cool addition to Google’s web based email service. Google added the feature back in August, in hopes slowing down rival Skype. They figured the best way to do that was make it free to U.S. residents. Surprisingly over 1 million calls were made on the first day of the service, which apparently prompted the Google Voice team to extend the promo. It’s very easy and straightforward to place a call in Gmail. 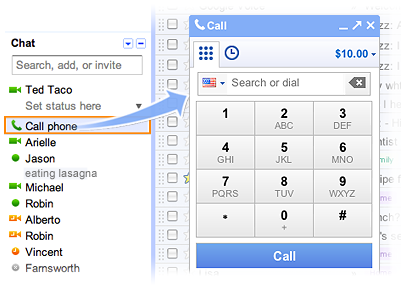 You just simply click on the Call Phone button located from inside your Google Talk chat sidebar. To make sure the service works you need to have the Gmail voice and video chat plugin installed, which can be found here. The Gmail Call feature is only available to U.S residents with a Google Voice account. For more information on the Gmail Voice calls head over to gmail.com/call.